Commonly used to achieve the ultimate smile makeover, porcelain veneers are custom-made, ultra-thin shells of tooth-coloured porcelain that are bonded to the front of your teeth. Comparable to what artificial fingernails can do for hands, veneers can transform crooked, badly worn, gappy or stained teeth; resulting in a true 'Hollywood' smile. Lee attended Smilemakers concerned with the appearance of his front teeth caused by a congenitally missing upper left central incisor. 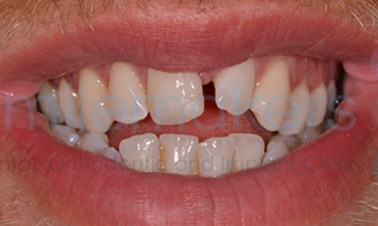 After careful consideration, a solution was found in two beautifully crafted porcelain veneers for this central incisors, creating a natural, balanced smile. When and why are veneers used? Veneers are very useful alternatives to crowns for anterior (front) teeth because they can be made very thin and should require little preparation of your tooth (unlike crowns), therefore causing less damage to the tooth. 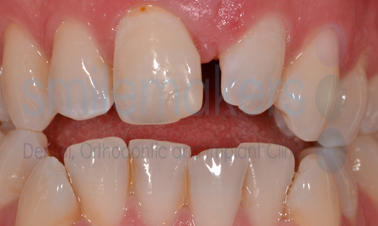 The aesthetic result achieved with veneers can be very good and greatly improve a smile. If the reason that you wish to have veneers is because you are unhappy with the position of your teeth it is very important to consider orthodontics as an initial step because veneers should remain minimal coverings and your dental health may be best served by alternative treatments. Alternatives to veneers include tooth-coloured filling materials (composites) which are bonded to your teeth and require even less preparation than veneers. These are usually cheaper but as a general rule will not last as long. 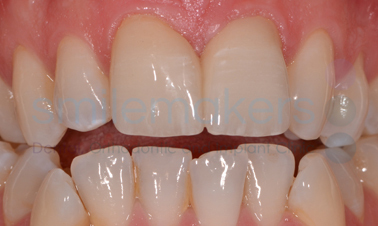 How are teeth prepared for veneers and how long will treatment last? 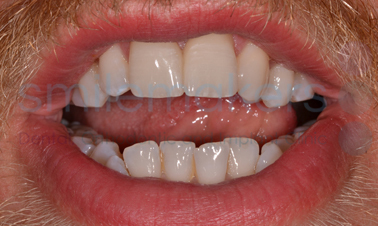 As mentioned above, veneers should require little preparation compared to a crown. Your dentist may give you a local anaesthetic to numb the tooth and do some preparation with the drill. They will take a shade for the veneers and may make a temporary veneer depending on the amount of drilling that has been required. Impressions will be taken to send to the dental laboratory and the veneers will take at least a week (usually longer) to make. They will then be cemented with a strong cement. The longevity of veneers depends on a number of factors (speak to your dentist) but should generally last 10 years before replacement is required. Require much less preparation of tooth than crowns. The process is usually not reversible. Veneers may require replacement should they chip or crack. Though not likely, veneers can dislodge and fall off. To minimize the chance of this occurring, do not bite your nails; chew on pencils, ice, or other hard objects. Individuals who clench and grind their teeth are poor candidates for porcelain veneers, as these activities can cause the veneers to crack or chip.